Generally, in a spirit of hope, we ask our teeth to last several decades longer for us than they did for our grandparents,” says Chapel Hill Dentist Dr. C. Michael Willock. 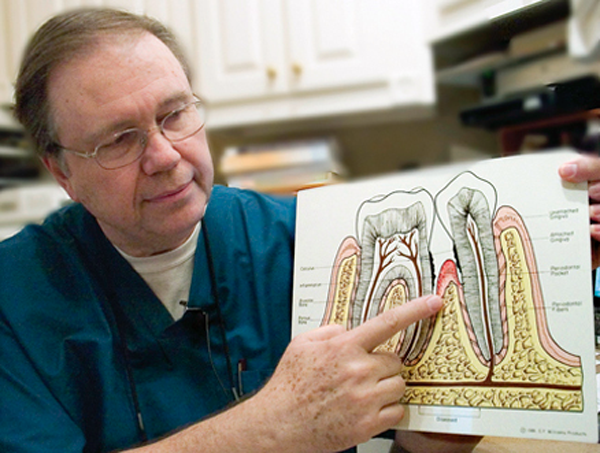 Key dental health issues that need special attention as we age, says Dr. Willock, include missing teeth, dental cavities, periodontal disease, oral and throat cancers, amalgam fillings, dry mouth, and facial pain, among numerous others. “Of these problems, oral cancers and periodontal disease are of greatest concern,” he notes, “and for some people, removal of amalgam fillings is an important health issue. “Every hour, around the clock, we have another death in this country from oral cancer,” notes Dr. Willock. “Deaths from oral cancer are more prevalent than deaths from brain, liver, testes, kidney, or ovarian cancer. Without good oral health, attaining optimal general health is an elusive and basically unattainable goal, which becomes increasingly true as people age, Dr. Willock believes. “In extensive and ongoing research, the American Academy of Periodontology (AAP) continues to make the case: infections in the mouth can cause major health problems in other organ systems in the body. The connections to diabetes, heart disease, and other illnesses is well-established. Healthy gums are a key component of overall good health. A serious threat to people whose health is compromised by diabetes, respiratory diseases, or osteoporosis. Have a family member with periodontal disease. Research suggests that the bacteria that cause periodontal disease can pass through saliva. This means the common contact of saliva in families puts children and couples at risk for contracting the periodontal disease of another family member or a pet. Dr. Willock has long expressed concern about the use of amalgam material containing mercury to fill dental cavities, and he notes that for the first time, the Food and Drug Administration, on its website, has indicated similar unease. Under the settlement, the FDA is required to issue a definitive statement about the safety of mercury amalgam fillings this coming July. There are, Dr. Willock notes, excellent options to the use of amalgam dental fillings. “We now have superior materials to place in teeth, such as composite resins and ceramics which bond to the tooth and seal it much better. Some people are more sensitive than others to the toxic effects of mercury leakage. In sum, Dr. Willock makes a strong case that our teeth can be both healthy and beautiful as the years pass. A talented cosmetic dentist, he adds “Certainly you’re never too old to express your personality with a beautiful new smile,” with a smile of his own.